Resin wicker rocker is a popular furniture and is found in numerous homes because it is sturdy and has a hardened surface due to the resin which protects the wicker from moisture and temperature damage. Increasing number of families are purchasing this furniture not just because of its coziness but also because as it adds drama and elegance to any homes patio. If you search for wicker chairs online you well be greeted with overwhelming styles and designs to choose from. Looking and examining each of them will just give you a headache. Here, I will give you three of the most preferred wicker rocker by consumers. One of these chairs was crafted by Spice Islands while two were produced by Northcape International. The chair from Spice Island is the most expensive among the three. Its average price is $520. 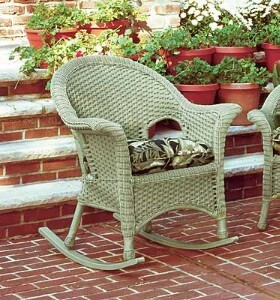 It is manufactures with a hard wicker and a natural finish. It has a south sea design which gives it a refreshing and tropical feel. You can choose from different fabric from the colors to the designs. But the downside of this product is that the cloth designs easily fade away. The second chair which is from Northcape International is the Port Royal rocking chair. Average price of this piece is $289 which is thought to be sensible by consumers. It has an aluminum frame, has a wide arm design and is crafted a tough resin weave. According to consumers this furniture is so easy to maintain since it is water proof. The third chair, still from Northcape International is the Vineyard outdoor white sicker rocking chair. Its average price is $198 and is the cheapest among the three. This chair last long because it is UV and weather resistant. It looks appealing inside or outside of your home. This chair maybe the smallest and the cheapest among the three but it gain many positive reviews. If you still want other options you can just check online and you will definitely find that wicker rocker chair perfect for your home.